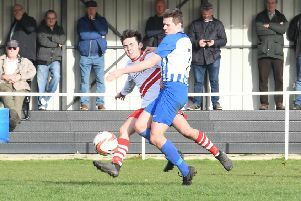 The top-of-the-table clash in the Boston & District Saturday League’s Workforce Unlimited Premier Division saw leaders Spilsby Town suffer a shock 6-1 home loss against Ruskington Rovers. Old Leake (blue) v Pointon (green). Luke Benton (blue), KC Kemp (green). Photo: David Dawson. Incredibly, five of the visitors’ goals came from the penalty spot, with Matt Leonard hitting a hat-trick. Sam Jackson, Steve Winter and Liam Tait were also on target for Rovers, while Callum Lawe scored the consolation goal for a Spilsby side who finished with 10 men following the dismissal of Jordan Turner. Spilsby remain top of the table despite dropping points for the first time this season, with Ruskington a point behind them having played two games more. Third-place Railway Athletic slipped up at home against Kirton Town as they went down 4-3 while Coningsby took all the points when they beat Wyberton Reserves 2-1 with both goals coming from Lee Gemmill. Old Leake (blue) v Pointon (green). Pete Samson (blue), Dom Kew (green). Dom Key hit a hat-trick as Pointon beat Old Leake 3-1 with Adam Tempest getting the strugglers’ consolation. Fulbeck United had a fine 5-2 win at Swineshead Institute, while Benington got their first point of the season with a 1-1 draw against fellow strugglers Skegness Town Reserves. Division One Fishtoft took all the points when they beat Pointon Reserves 3-0 with goals from Liam Shinn, Carl Tate and Tim Bell. Horncastle Town Reserves moved up to second with a 6 -0 win against Swineshead Institute Reserves and FC Hammers had a fine 4-2 home win against Friskney. Old Leake (blue) v Pointon (green). Will Gosling (blue), James Zealand (green). Photo: David Dawson. In Division Two, Railway Athletic Reserves moved within a point of leaders Eagle United with a 5-0 win away to Coningsby Reserves. Colsterworth tavelled to JFC Boston and won the game 3-2 despite goals from Alex Lote and Louis Gosling. There were certainly plenty of goals in Division Three as the game of the day saw Old Don Reserves beat Fosdyke Reserves 9-4. Boston College Reserves beat Benington Reserves 4-1 thanks to a brace from Deividas Urbsys and strikes by Jack Mitchell and Piotr Puchala. Old Leake (blue) v Pointon (green). Adam Tempest (blue), Steve Daubney (green). Photo: David Dawson. Goals from Ben Liu and Ryan Summers could not prevent Park United Reserves going down 5-2 at Woodhall Spa. In the Target Newspapers Challenge Cup, Boston College found the net nine times against Holbeach Bank, Garth Baxter getting the only goal for the losers. Bull Athletic beat Woodhall Spa 5-2 while Fosdyke beat Caythorpe 4-3 with goals from Ash Davis (two), Daniel Fletcher and Alex Cammack. Jimmy Harris hit four goals as Park United beat local rivals Mareham United 7-0, Declan Wilson adding a brace and Ben Dean also getting on the scoresheet. Josh Whittam scored both goals for Skegness Town A as they beat Wyberton A 2-1 in extra time. Old Leake (blue) v Pointon (green). Jack Titmarsh (blue), Nathan Wilson (green). Photo: David Dawson.